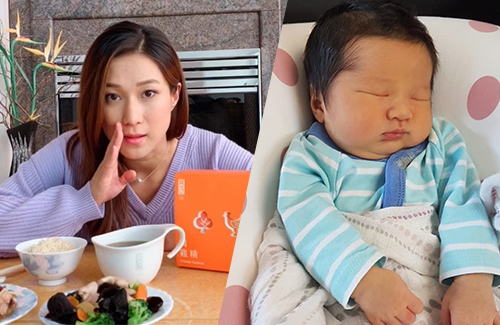 In September, Linda Chung (鍾嘉欣) gave birth to her second child Jared, a baby boy. Though it’s only been a month since Jared’s birth, the 34-year-old actress has already returned to her pre-pregnancy weight and is prepared to make a full-fledged comeback. Linda said it is important to divide the attention equally between all children so favoritism would not come into play. “This is why now I have to give her some more special attention. I have to make sure she’s okay first. Now Kelly loves her little brother. She would want to hold him, help him wipe off his drool. Everything’s been going smoothly. The baby is pretty chubby with a very chubby face. Very cute. His eyes should be pretty big too. i kinda hope that she would just stay in canada. tvb is pretty bad as it is now. Why is Linda still in the news? She’s irrelevant. Her advice is nothing groundbreaking and most people would snerk at how it must be easy not to have stress with a millionaire husband. But I don’t disparage her happiness and think this trite interview is due to the media not really knowing how to ask questions or write on motherhood. I saw some pictures of her baby on Instagram. He is sooo cute. Super chubby.